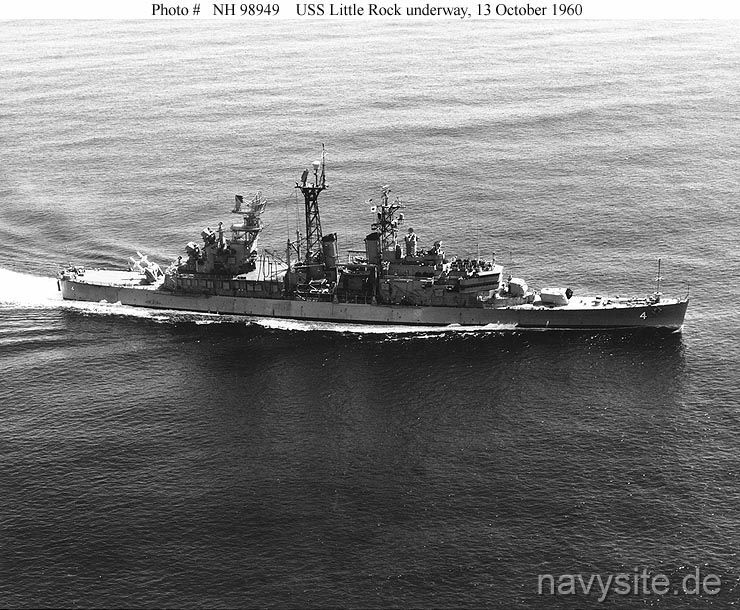 Originally built as a CLEVELAND - class light cruiser and commissioned as CL 92, the LITTLE ROCK was named after the capital city of Arkansas. 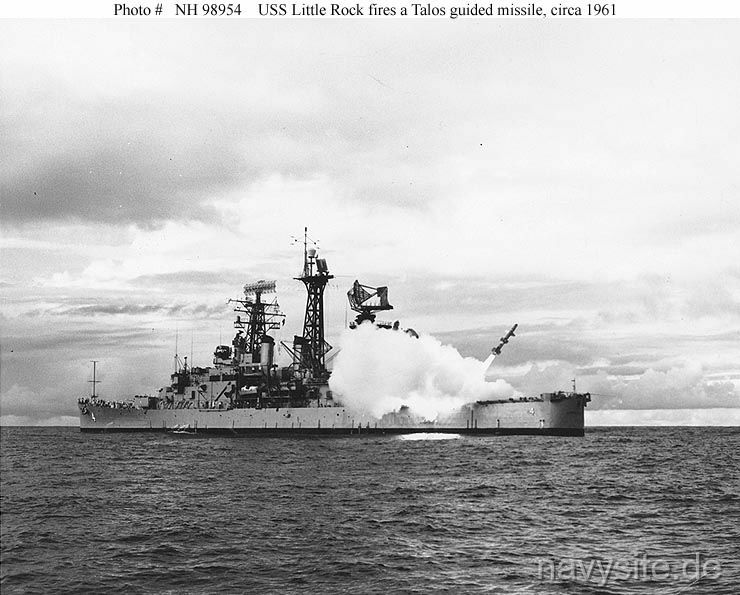 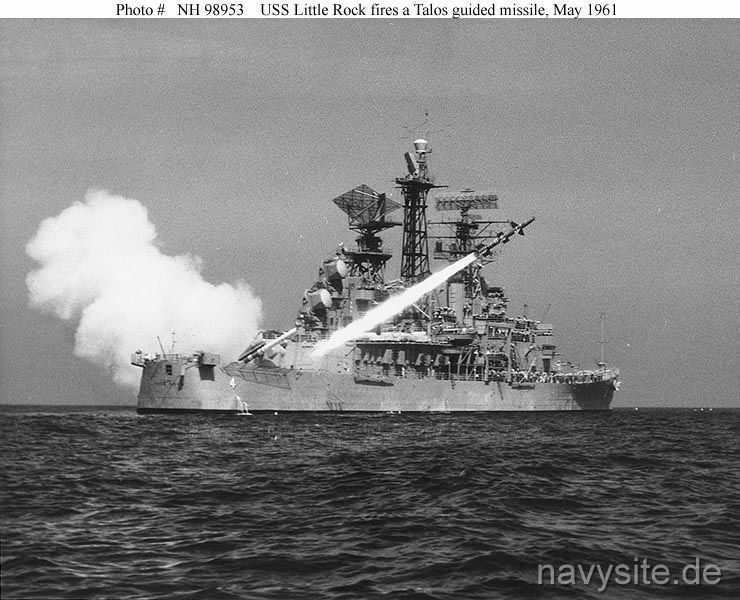 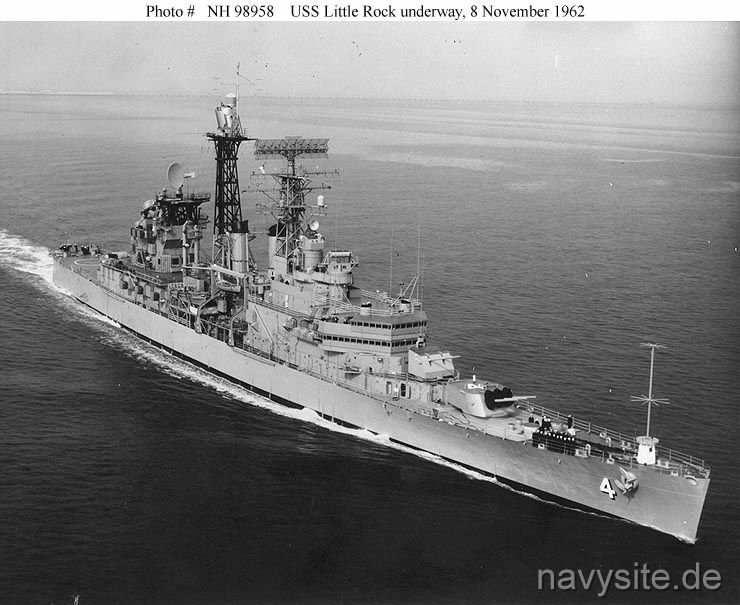 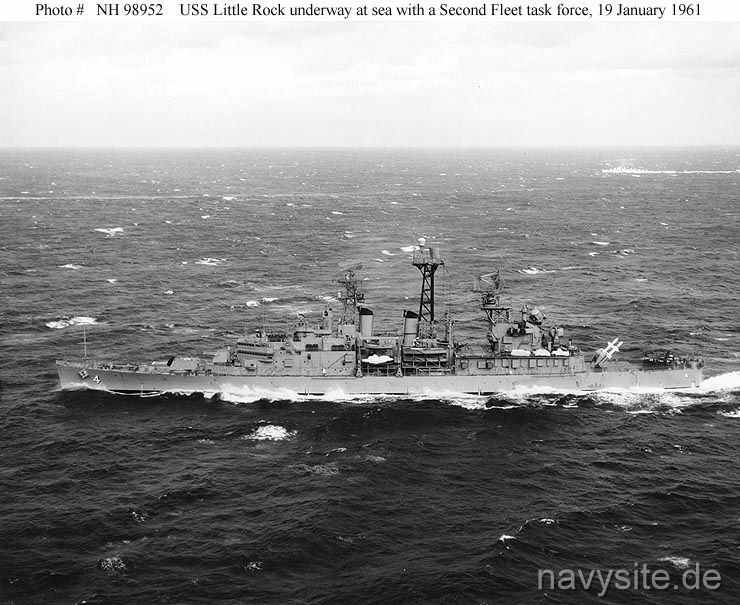 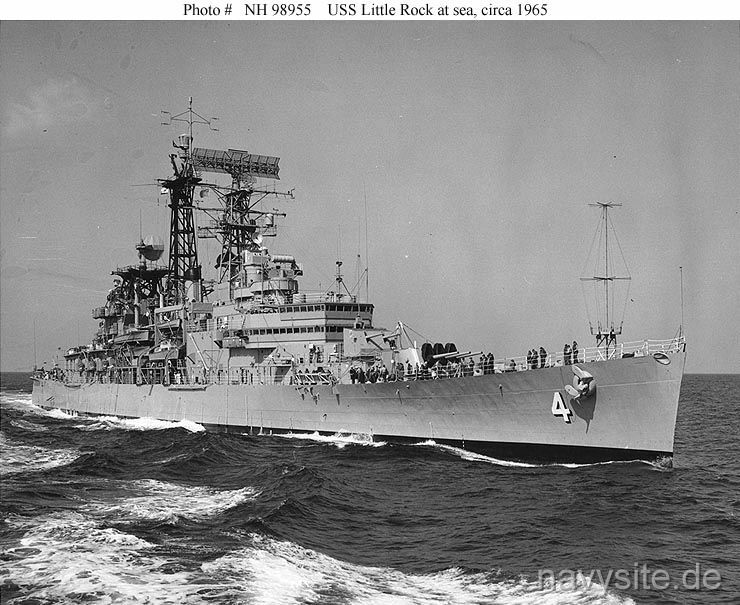 Extensively converted to a light guided missile cruiser from 1957-60, LITTLE ROCK was recommissioned as CLG 4. 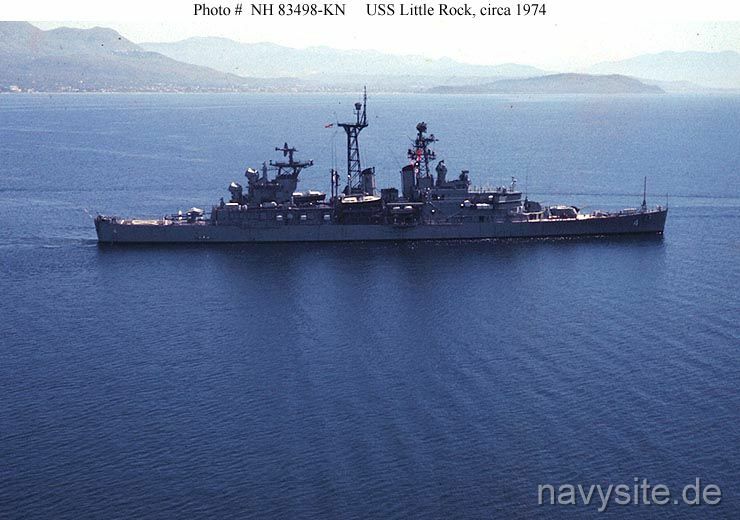 On July 1, 1975, the ship was again reclassified CG 4. 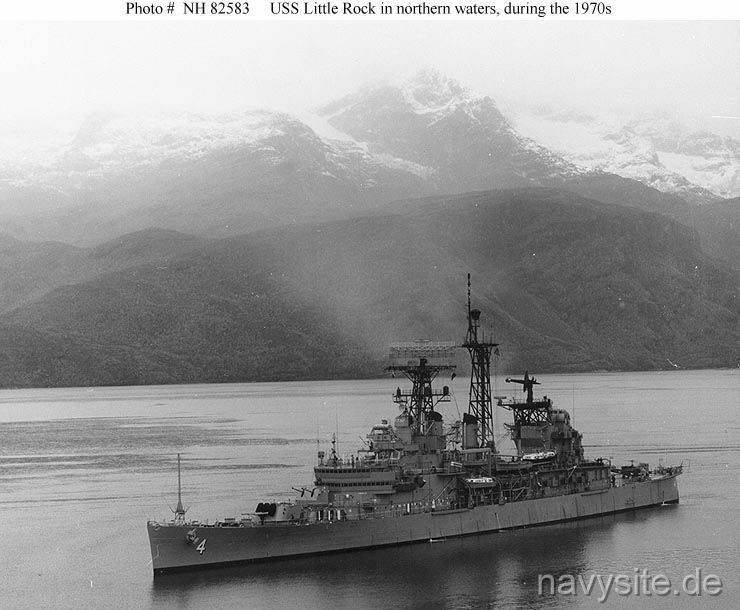 Both decommissioned and stricken from the Navy list on November 22, 1976, the LITTLE ROCK was donated to the Buffalo and Erie County Naval & Military Park as a museum ship on June 1, 1977. 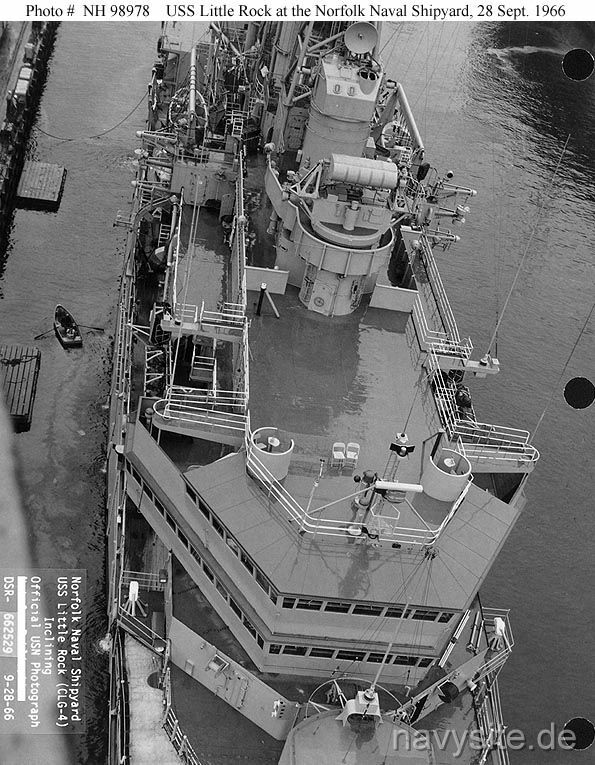 Builder: Cramp Shipbuilding Co., Philadelphia, Penn. 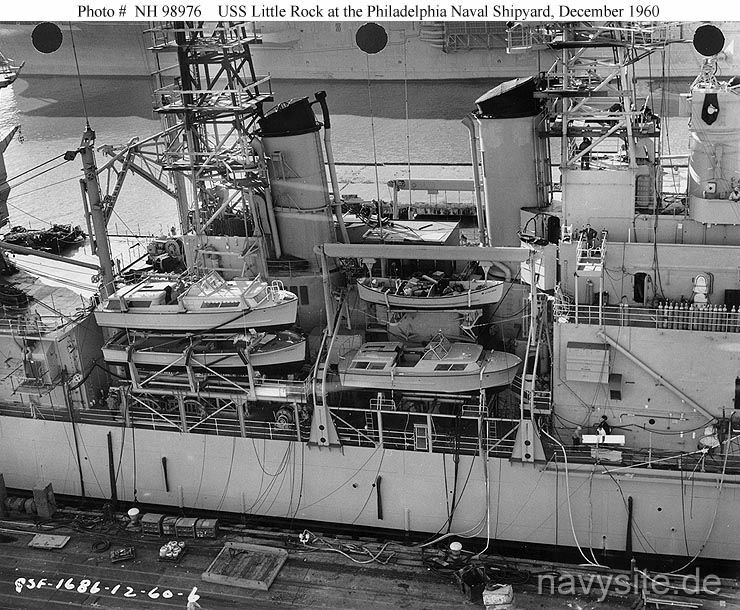 This section contains the names of sailors who served aboard USS LITTLE ROCK. 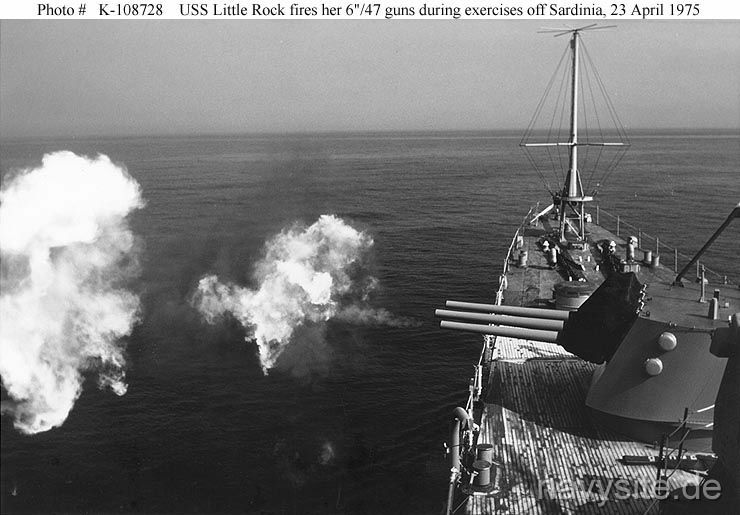 These are no official listings but contain the names of sailors who submitted their information. 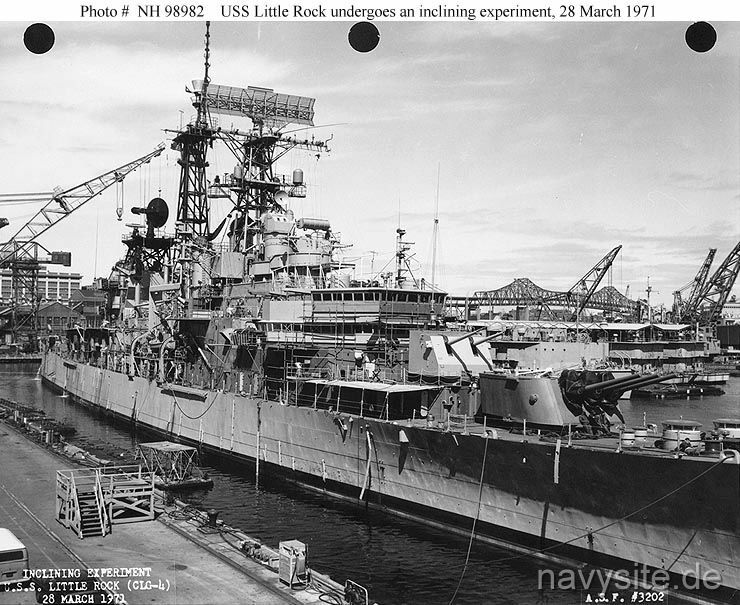 Click here to view the list for CL 92. 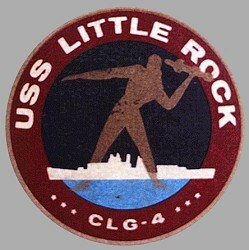 Click here to view the list for CLG 4. 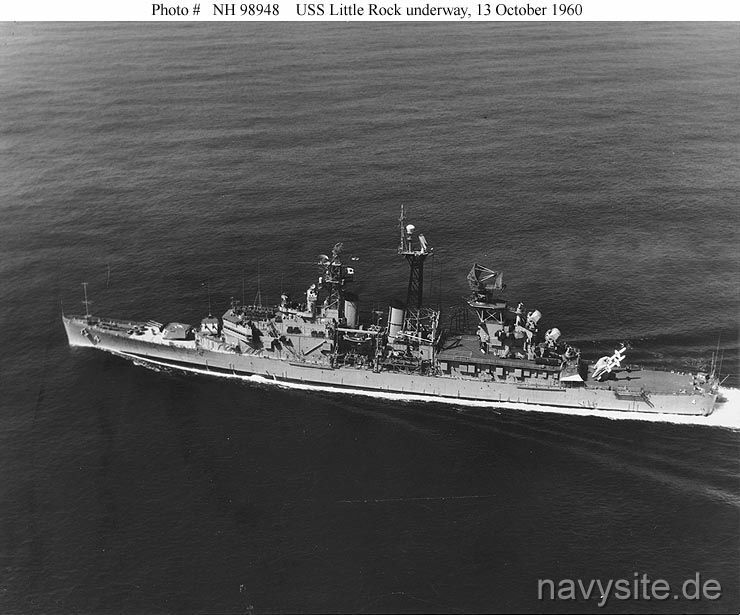 Click here to see which USS LITTLE ROCK memorabilia are currently for sale on ebay. 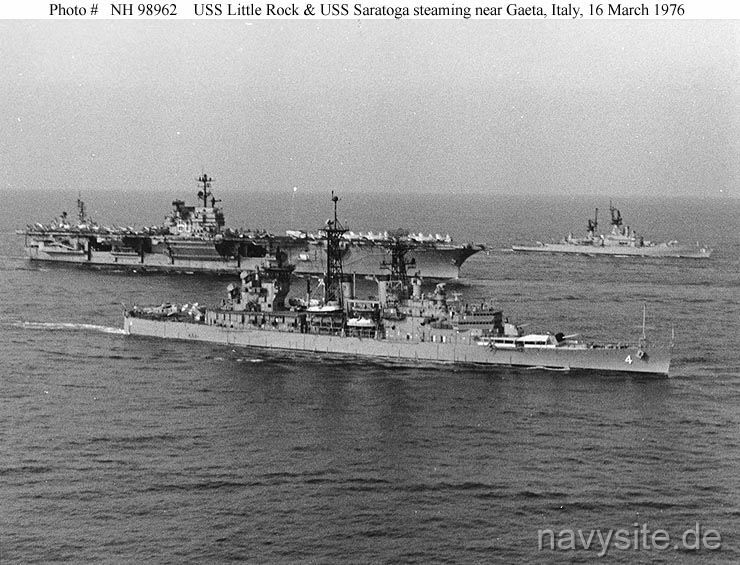 June 13, 1970 Gulf of Laconia, Greece USS LITTLE ROCK and the Greek destroyer LONZHI are in a minor collision during NATO exercise Dawn Patrol 70. 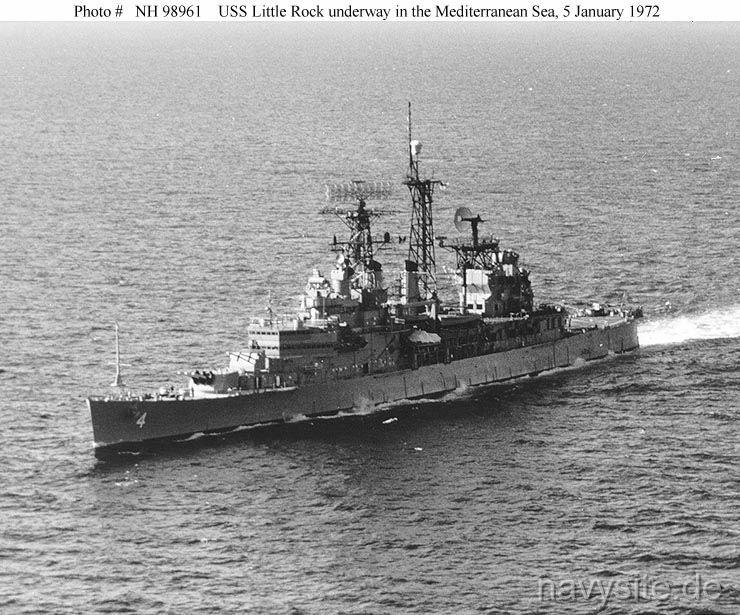 May 1, 1976 Tyrrhenian Sea USS LITTLE ROCK suffers an engine casualty in the main engine lube oil system. 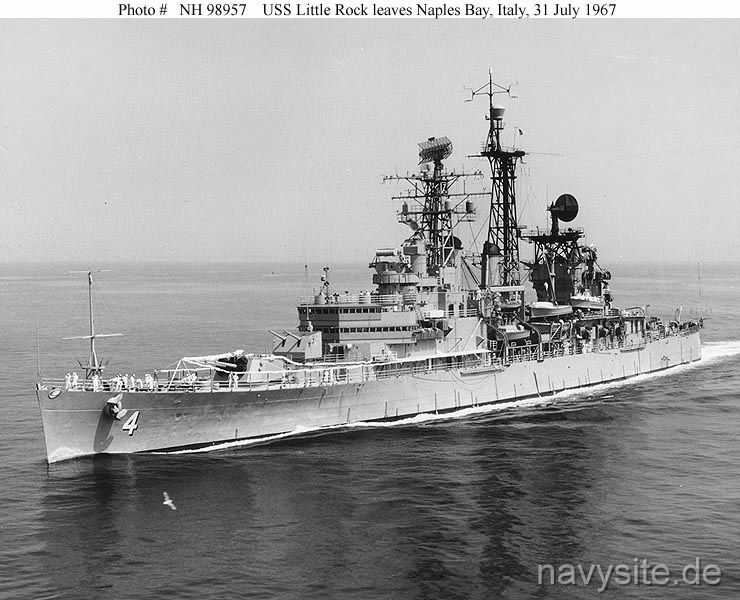 The ship subsequently proceeds to Naples, Italy, arriving there the next day. 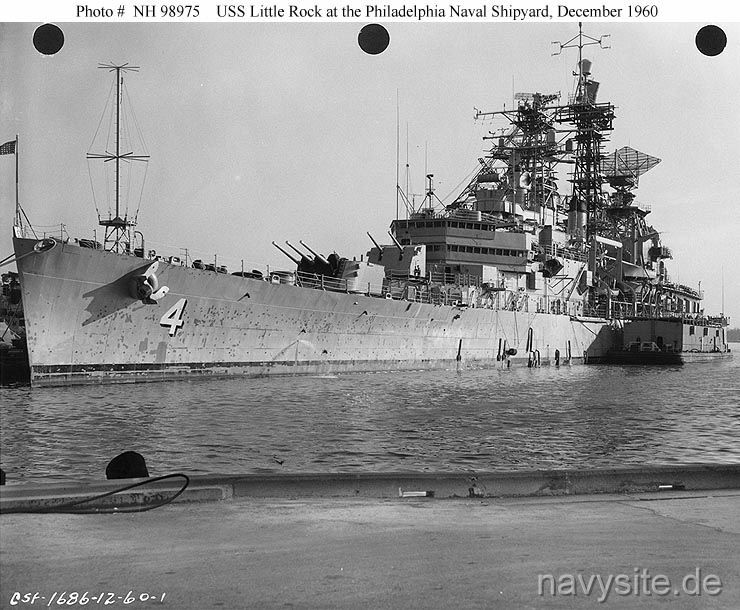 USS LITTLE ROCK was built at Philadelphia, Pennsylvania. 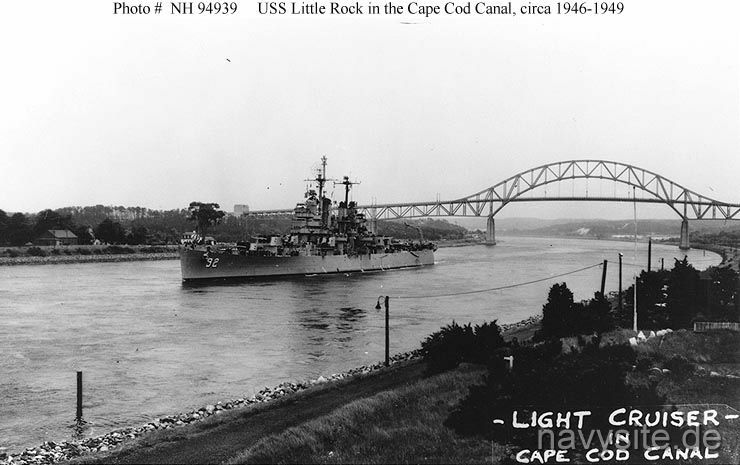 Commissioned in mid-June 1945, two months before the end of the Pacific War fighting, in October of that year she began her maiden operational deployment, a cruise to Latin America that lasted until March 1946. 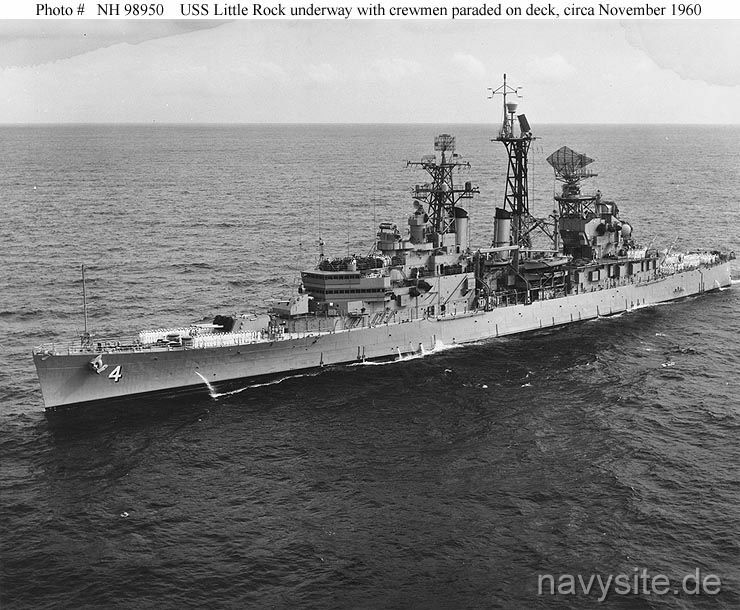 LITTLE ROCK served in the Mediterranean Sea in June-September 1946 and again during 1947 and 1948. 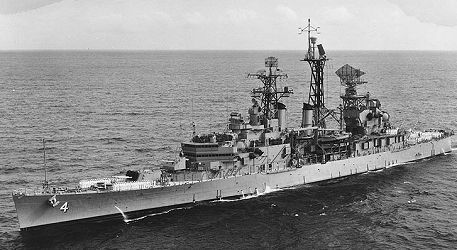 One of many light cruisers eliminated from the active force by Truman Administration defense economies during the latter part of the decade, she was decommissioned in June 1949. 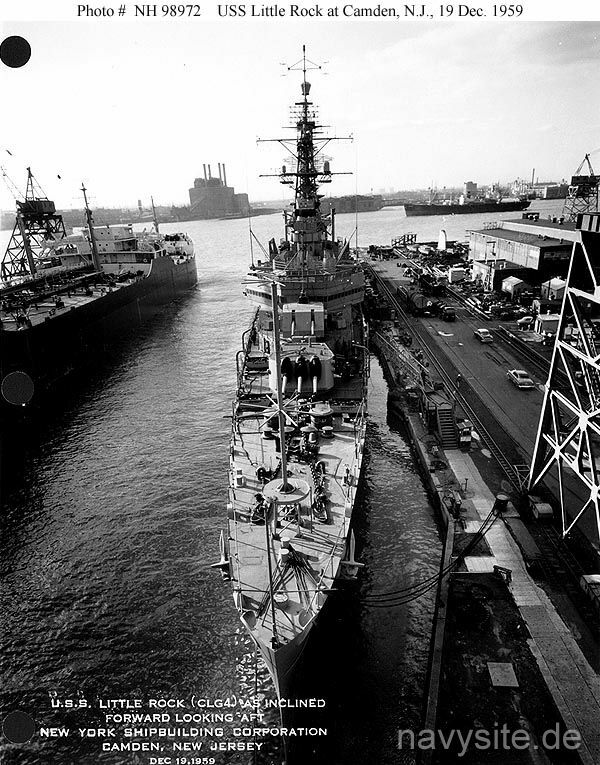 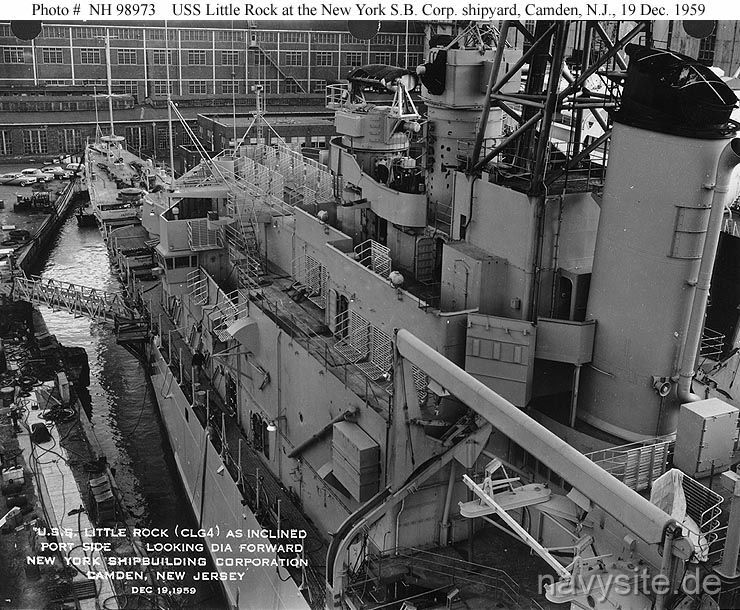 Laid up in reserve since June 1949, LITTLE ROCK was redesignated CLG 4 in May 1957, some months after beginning conversion to a guided missile light cruiser at the Camden, New Jersey, shipyard of the New York Shipbuilding Corporation. 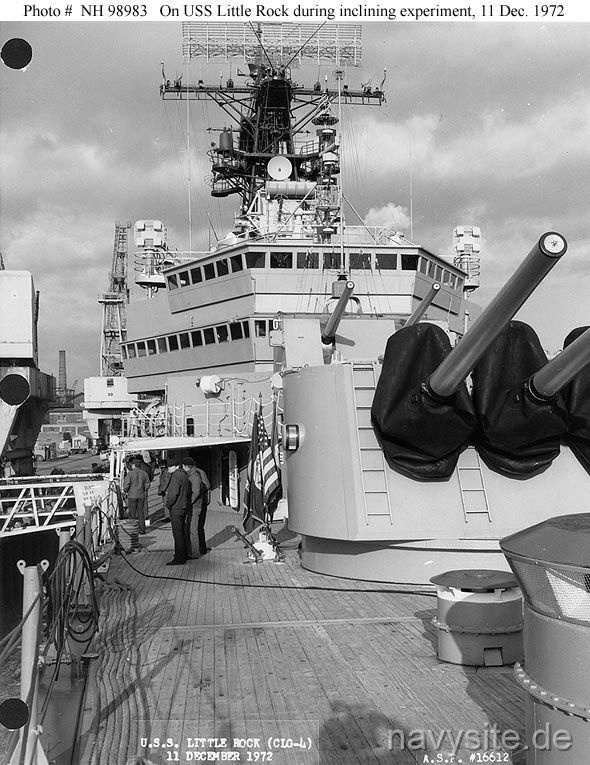 When recommissioned in June 1960, the ship had been significantly transformed. 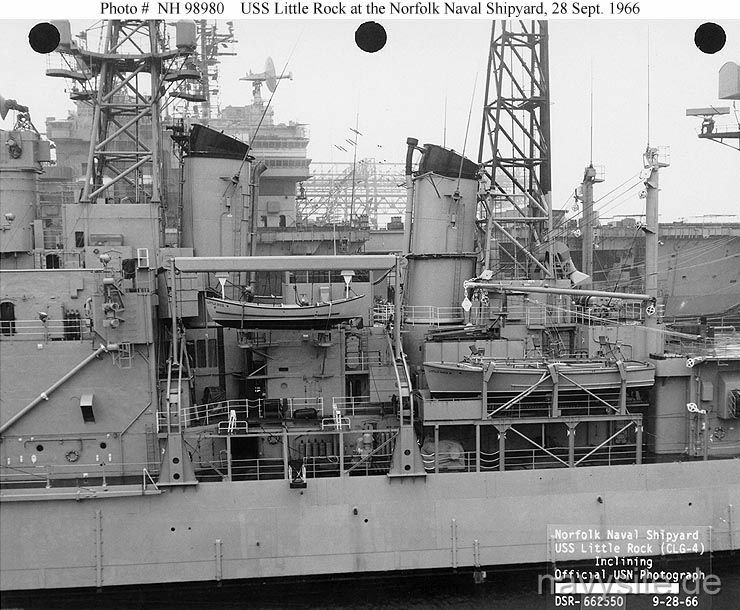 She now had huge superstructures forward and aft of her two smokestacks, the forward one housing command spaces that gave the cruiser a new mission as a fleet flagship. 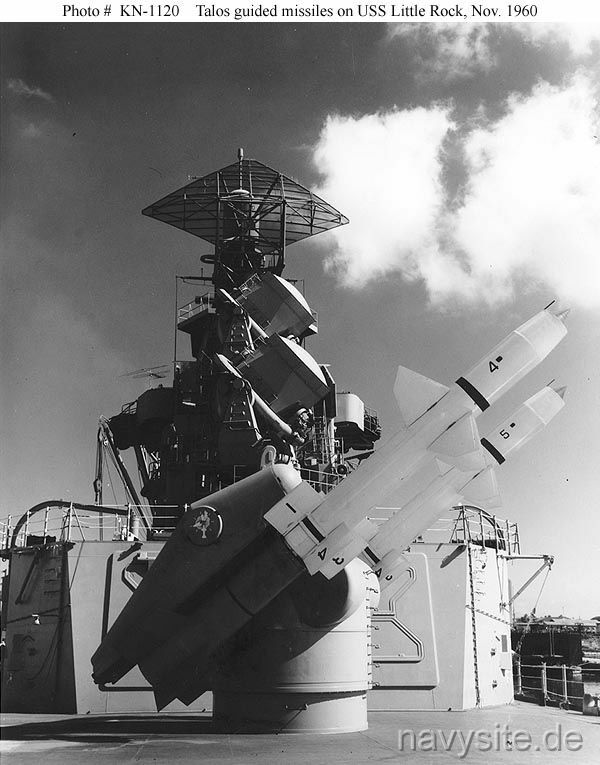 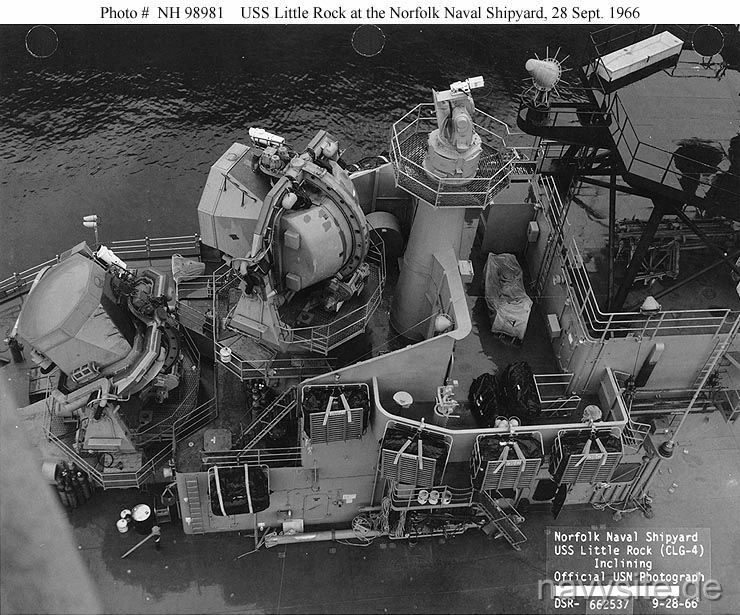 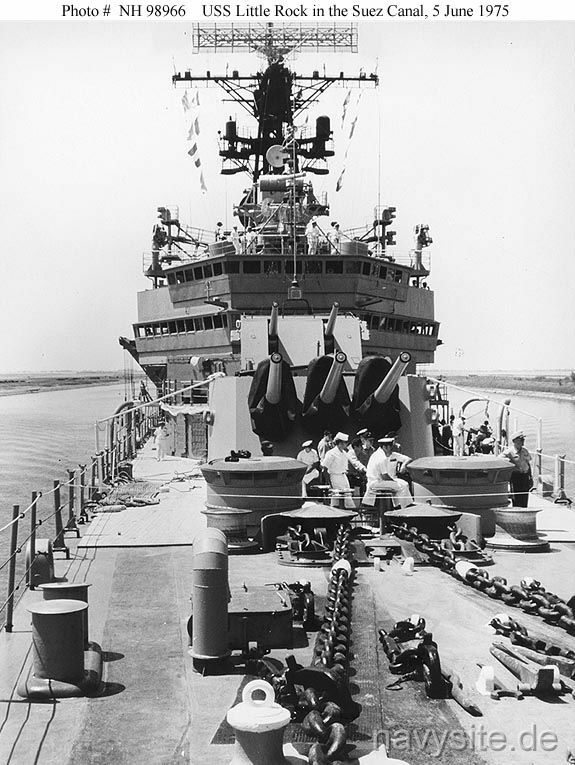 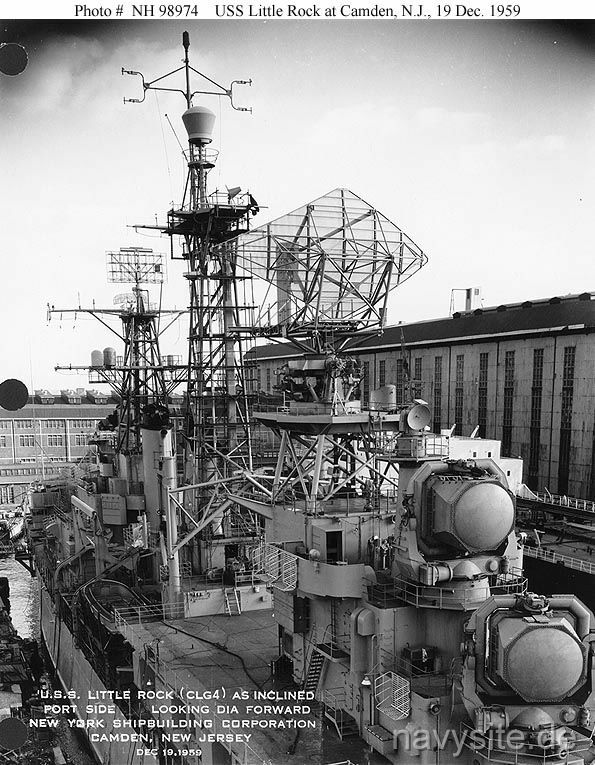 The after superstructure held magazines and handling rooms for long-range Talos guided missiles, whose twin-armed launcher dominated LITTLE ROCK's after deck. 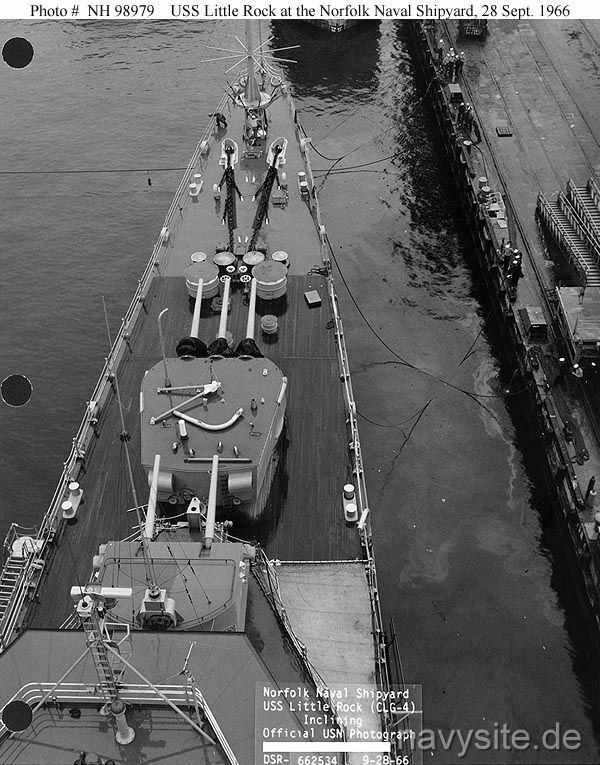 Only one triple six-inch gun turret and one twin five-inch gun mount remained of her original battery of four and six of each. 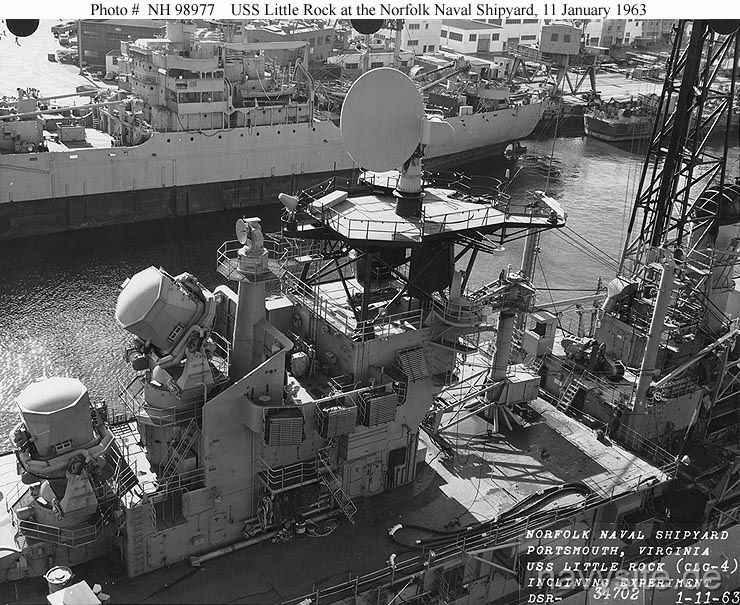 Topsides, two tall lattice masts and the after superstructure were topped by an elaborate array of radars to detect and track enemy aircraft and guide Talos missiles to intercept them.